Under consideration — all of the improvement suggestions we’ve selected and that are about to be prioritized. 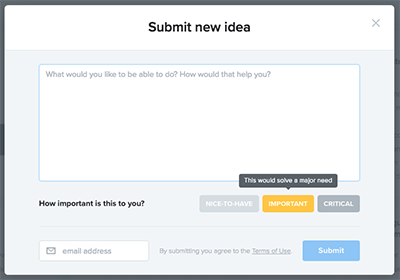 If you have a feature request, you can submit it at any time. By adding an importance label to any request in the product portal, you can help us prioritize it. Any extra details and use-cases would help us better understand your needs. Planned — the product updates that are scheduled and are about to be rolled out in the following weeks. In progress —the features we’re already working on, which will soon be released. Launched —all of the product improvements we’ve rolled out by now. Since we’re here, we’re releasing three important ones as we speak, see below. 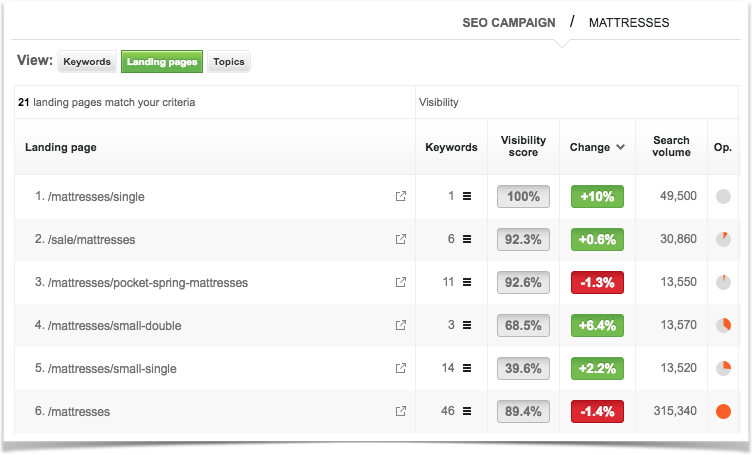 SEOmonitor was designed to track non-branded keywords. That’s why the branded keywords were limited and primarily used as rules, to split the organic traffic into branded and non-branded. Starting today, any number of branded keywords can be tracked daily, on both devices. However, they will not be included when calculating the Visibility Score and they will automatically be separated from the non-brand keywords, always remaining in their dedicated group. Thanks Mathilde from Just Eat, Wesley from TUI and Amira from Verve Search for pointing this out. Exports should reach you instantly, because you need them right away. However, the requests can sometimes take longer to be processed, so we’ve moved them to the backend and we’re emailing them to you when processed. Instead of refreshing the inbox until you receive the export, you can now continue your work in the platform and we’ll let you know when they’re ready for instant download. Thanks, Ilyas, for the heads-up on this! As many of our users started to rely on smart groups, we’ve enabled the Landing Page and Topic view for them too. We’ve coupled that with another important functionality: sorting the landing pages by the impact their keyword rank changes had on the overall Visibility Score — how many impressions they won/lost. So go ahead and explore our Product Portal — which you can access from the right corner of the platform —, to see what’s already in the pipeline, vote for what is important to you or even submit your request. And keep an eye on it, as we’ll be rolling out new ones on a weekly basis!